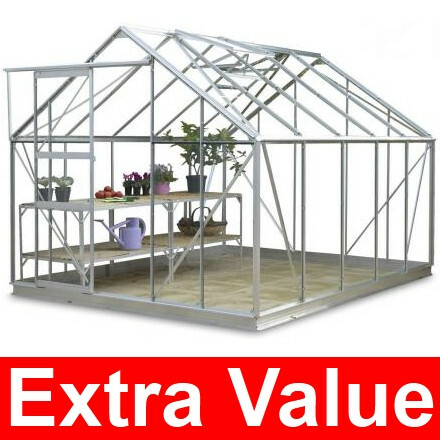 This premium greenhouse deal is an absolute steal at this price. The greenhouse is manufactured in the UK, and is stronger than any greenhouse in its class, and guaranteed for 10 years. Choose from standard multi-pane overlapping Horticultural Glass or Large Pane Toughened Glass for extra safety. Stainless Steel band clips are used, rather than standard galvanised wire ones to secure the glass in place. Brass-centred wheels with ball-bearings will outlast normal PVC greenhouse wheels many times over. All these premium features are now available on this greenhouse for a great price. This package deal is delivered FREE to you in 3 -5 weeks. The warehouse will call you about 10 days prior to delivery to let you know when your greenhouse is coming. Sizes: 12'4" Long x 8'3" Wide, 2' Wide x 6'2" High Door in the 8'3 side, Eaves/gutter height 4'3", Ridge Height 7'4"
PLEASE NOTE: The photo shows the 10'4 long version - this item is actually 2ft longer than the photo, at 12'4 Long. So instead of five glass panels down the side, it has six. The staging shown in the photo is not included in this deal.